Welcome to issue 11 of liveartwork DVD, a unique publication showcasing contemporary live art. The latest issue features six artists and over one hour and forty five minutes of video. First is Esther Pilkington, with a solo monologue performance based on her recreation of one of Richard Long's famous walking works. Madrid based artist Félix Fernández presents two performance works in which he deals with the seduction of contemporary capitalism. Michela Depetris & Francis O´Shaughnessy are an Italian and Quebecois duo with documentation from a recent performance made in Berlin as part of the Platform Young Performance Artists. Also filmed while performing in Berlin is the Dutch artist Ieke Trinks with a solo performance presented as part of the BBB Johannes Deimling Performance Art Studies Workshop. Total running time of the DVD is approximately 106 minutes. Scroll down to see more detaills about the featured artists. To get a copy of liveartwork DVD issue 11 click on the 'order' link above. 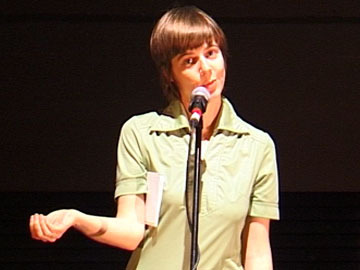 Esther Pilkington is a performance maker and researcher who works both solo as well as in a number of collaborative contexts, most regularly with the collective Random People which she co-founded in 2007. She has realized projects in Wales, Germany and Austria and her work has been shown across Europe. Esther's solo work focuses mainly on notions of journey and mobility, and explores various ways of giving accounts of journeys. She is currently undertaking a PhD. project researching the element of journey in contemporary performance practice at Aberystwyth University, Wales. She also teaches performance and gives workshops. A Long Walk is lecture performance about a re-enactment of Crossing Stones (1987), in which walking artist Richard Long carried a stone from Aldeburgh on the English east coast to Aberystwyth on the Welsh west coast and back. In April 2009, Esther Pilkington retraced Long's walk as well as the two places in Great Britain that she has a personal relationship to: the place where she is living now and the place where her grandparents lived. Félix Fernández's work centres on the contemporary individual's relationship with the environment they find themselves in (time, space, body, identity, socioeconomic situation, landscape, media, etc.). His sharp subjective vision aims to engage spectators and thus give his work meaning. He uses a wide range of different formats and creates hybrids between photography and performance, audiovisual shows, installations, videos, etc. The body plays a key role in his work and he often features himself, adding an autobiographical dimension that combines with the symbolic power of objects and situations to create a language that mixes reality and fiction in equal parts. Turbodriver articulates a post-modern tale. It is fragmentary and full of cracks. The protagonist and his story wander through a hostile context that is orderly only in appearance. The action immerses us in the deconstructed process of contemporary existence – where the individual wades into surroundings hyper-populated by directed information, induced necessities and instrumentalized movements. Turbodriver is inspired by the term "Turbo Capitalism" coined by Edward N. Luttwak to describe the historical moments in which we are living. Sólo por Dinero (Only for Money) took place in Madrid's city centre, which the city council is attempting to transform into one big commercial space, where it is practically impossible to spend one's leisure time for free. 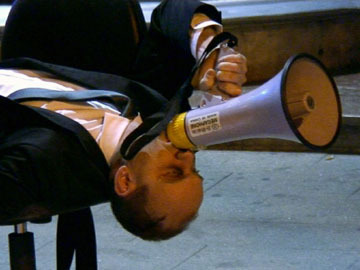 The performance is inspired by the global economic crisis and presents a beaten character who moans through a megaphone. His wails are nothing more than a constant enumeration of luxury consumer goods and are accompanied by penitent's pose as he asks for clemency. The action refers to the end of a moment of material glory, to the decline of some decadent values. Francis O'Shaughnessy is a Quebec artist in Fine Arts, with frequent presentations in performance art, installation and videography. He has a Master's degree in Performance Art and Installation from the Quebec University in Chicoutimi. Since 2007 he has organized the Art Nomade Festival at Saguenay. Michela Depetris is an Italian artist in Fine Arts who presents hybrid projects in performance art, photography and videography. She has a Master's degree in Performing Arts and Visual Culture from the Museum Reina Sofia in Madrid in Spain. 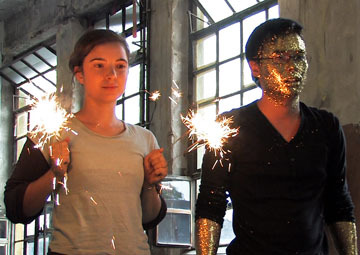 Together they have been collaborating on different performance art projects since 2010. FM-16 is a recent performance that talks about listening, the relationship between two people and objects. Gwendoline Robin relates objects with the body in space to create ever more complex installations and performances. 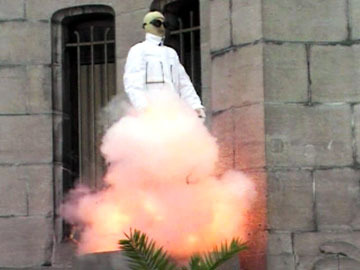 The object responds to space, movement to fire, light to the sound of the explosion. The artist's body can explore, perform and dance with the danger and poetry of fire. Robin's work deals with immediacy; creating a relationship with the present moment. It confronts us with surprise, fear, danger, relief and with wonder, too. - T. Nasielski. Gwendoline Robin is based in Brussels and also works in the medium of installation, video and drawing. Faced with the Museum's sculpture I create, for a moment, a new, ephemeral sculpture. I paint a wooden ladder twice, an absurd but controlled action which takes some time. When the ladder ignites, I lose control for a moment of time – but also there is excitement and fear as we see that fire can create a surprise. I started to focus on performance art during my Master's studies in Fine Arts in the Netherlands, from which I graduated in 2008. Since then performance itself has often been the subject of my work. This evolved into actions, presentations, demonstrations, interventions, installations and registrations in which self-awareness plays an important role. I often use easily recognizable, everyday elements placed in the context of a staged situation or site-specific work. Alongside my solo practice I collaborate with two collectives, one is a food-performance based duo called Neandertaler and the other is Trickster which focuses on improvisation in performance art. Since 2009 I am the co-producer of PAE (Performance Art Event) in Rotterdam. I Like to Educate Myself presents a composition of actions that bring learning into practice. Different types of learning techniques are explored, such as observing by changing perspective, challenging muscular movement and testing social skills. In a society in which educational systems are highly appreciated, I want to point out the value of life itself as an educational substitute. Miet Warlop has a master in Visual Arts from the Royal Academy of Fine Arts in Ghent (2003). She won the prize for young theatre work at TAZ with her graduation project Huilend Hert/Aangeschoten Wild. She also works as a scenographer for other artists' performances. After making her solo performance called Grote Hoop/Berg she made Springville, a 50 minute moving game of chaos, expectation and surprise. Springville was selected for the Antwerp Theatre Festival in 2010. Currently she lives in Berlin where she is working on new series of dynamic performances while also developing her visual art work. In Springville we witness the constant metamorphosis of a small universe in which characters, half human, half object, try to function together and alongside one another. By employing an absurd logic and by playing with proportions, these characters move us with the results of their dis-functionality in their poetic game of chaos, expectation and surprise. Along the way they lose their trusting nature and the environment changes into the scene of a still landscape that's running wild and unfolds into infinity. From the moment something has found a place in Springville, it is turned upside down or broken. As the story develops, reality itself is constantly transformed. © liveartwork 2006 - 2010. All Rights Reserved.